Rodney Redus of Oklahoma City votes at the Oklahoma School of Science and Mathematics polling location in Tuesday's primary. Only 47 voters had cast their ballots at the site as of 2:30 p.m. The potential size of a so-called “teacher caucus” in the Legislature was significantly whittled down Tuesday after 20 current or former educators lost their primary battles. Many of the candidates running on a platform of increasing state funding for public schools and teacher salaries were taken down by members of their own party and will not advance to November’s general election. 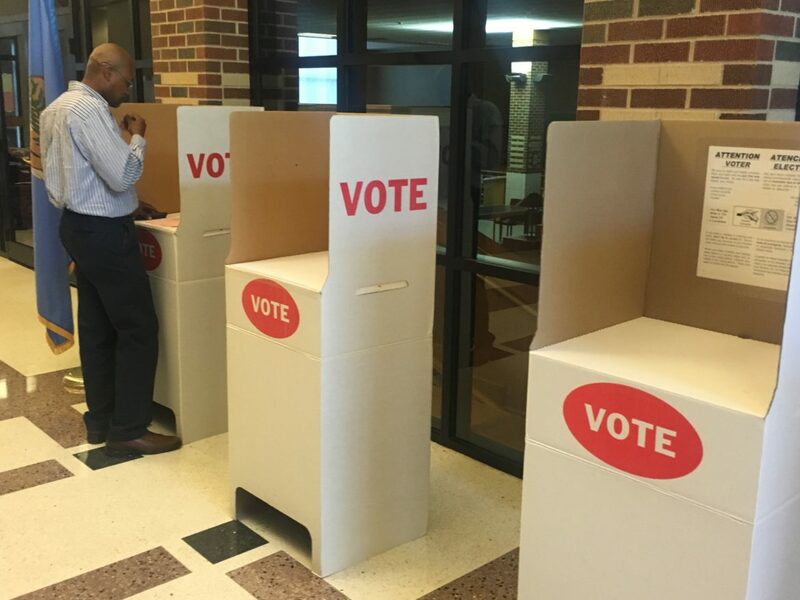 At least 40 candidates who had a background as a current or former educator, administrator, school support staff or school board members were running in the 84 state Senate or House contested primary races decided Tuesday. They were part of a record-setting number of candidates who filed for state races this year. But only 20 of those 40 candidates, almost all of whom were political newcomers, will continue this political season. And five candidates of that 20-member group must win a run-off contest to make November’s general election. Twenty-three other candidates with direct education ties did not face a primary and won a free pass to November’s contest. That means there are still a significant number of surviving candidates who seek to change the public education landscape. A good portion of these candidates will face incumbents from outside their party in November. If Tuesday’s results are any indication, they will face steep odds in the general election. All three of the candidates with education backgrounds who faced an incumbent lost their election bids Tuesday. Sen. Kyle Loveless, R-Oklahoma City, defeated Mustang High School science teacher Mike Mason; Rep. Charles Ortega, R-Altus, defeated Altus Board of Education member John Thomas; and Rep. Scott Martin, R-Norman, defeated Noble High School teacher Marilyn Goll. Several in the group of educators also lost open races that did not feature a returning sitting lawmaker. In several of these cases, the winner was the benefactor of contributions from the Oklahoma Federation for Children Action Fund, a school-choice political action committee that supports offering vouchers to attend private schools. The group used independent expenditures – campaign spending that pays directly for campaign ads, mailers and other activities and must be made without the coordination or solicitation of the candidate – to also oppose several candidates who have promised to seek more money for public education. The federation spent money opposing former high school teacher Jean Oliver in the Senate District 29 race, Blanchard Public Schools Superintendent Jim Beckham in the House District 42 race, Bixby School Board Member Lisa Kramer in the Senate District 25 race and Mason in his Senate District 45 race. All of those candidates were defeated, with the exception of Kramer, who will face a run-off contest. Several other candidates who have a background outside of public education have made school funding a priority in their campaigns and have linked their election bids to this unofficial “teacher caucus.” Several of these legislative hopefuls also were defeated Tuesday. This includes Sand Springs City Councilman Brian Jackson, who is married to a current public school teacher. Jackson lost to Sen. Dan Newberry, R-Tulsa, in the Senate District 37 contest. Overall, Tuesday’s primary results didn’t produce a clear picture of whether frustration about the state’s lack of funding for public schools – something that brought out hundreds of protesters during this year’s legislative session – will result in a meaningful change in the make-up of the Legislature. Of the 15 primary wins from those with an education background, all but two of those were on the Democratic side. This is somewhat unsurprising since Democrats represented 39 of the total group of 63 candidates with direct ties to education who filed for legislative races. But since Republicans are all but assured to control both chambers of the Legislature once again, they will carry the most influence in policy changes. Republican candidates with direct ties showed some signs of success, such as Putnam City school board member Tammy West winning the GOP nomination for the open House District 84 seat and former Muskogee High School Principal Dewayne Pemberton taking the GOP nomination for Senate District 9. And Thomas, the Altus School Board member, lost to Ortega, the House majority leader, by just 42 votes. Republicans with education ties also earned enough votes to move on to run-off contests in the GOP’s Senate District 25, Senate District 31, Senate District 19 and House District 60 races. The mixed results from the teacher caucus also wasn’t too surprising since public education advocates acknowledged heading into Tuesday that not all the candidates would survive. Angela Clark Little, an education activist who co-founded Oklahoma Parents and Educators for Public Education, acknowledged that many of the educator candidates her group supported – especially those with little or no political experience – faced steep odds. Clark added the fact that so many candidates were at least willing to run was an indication that the issue of funding for public schools is reaching a tipping point. But Tuesday’s results indicate that Clark and others cheering the pro-education movement will have to wait until November to see if these candidates’ messages can truly resonate with voters. Sitting legislators largely fared well elsewhere – but three incumbents won’t be returning next year. A total of 24 Republican and four Democratic incumbent legislators drew challengers from their own parties. All of those won with the exception of Rep. Dennis Johnson, R-Duncan, who was defeated by Marcus McEntire; Sen. Corey Brooks, R-Washington, who lost to Paul Scott; and Rep. Ken Walker, R-Tulsa, who lost to Carol Bush. Tuesday’s results showed more incumbent defeats than in recent years. Only one incumbent was defeated during the 2014 and 2012 primary elections combined. It is still possible that many of these incumbents could be voted down during the general election. But most will have to wait until November to see if they can survive a challenge from outside their party. Oklahoma’s five U.S. House members, who are all Republicans, survived their challenges Tuesday. U.S. Reps. Tom Cole, Markwayne Mullin, Steve Russell, Jim Bridenstine and Frank Lucas defeated their primary challengers. Since he has no Democrat, Libertarian or Independent challenger, Bridenstine has secured his re-election. But the others will all face at least one opponent in November. A dozen legislative candidates won’t have to campaign any further after winning their races Tuesday. These candidates did have an independent or another candidate from a different party file for their seat. That means they won’t have to compete in the general election and they have now secured a spot in next year’s legislative class. The incumbent candidates include Sens. Loveless; Ron Sharp, R-Shawnee, and Bryce Marlatt, R-Woodward, and Reps. Chuck Hoskin, R-Vinita; Mark Lepak, R-Claremore; Donnie Condit, D-McAlester, and Ortega. New faces who will arrive as freshmen legislators are James Leewright, a Republican from Bristow; Tom Dugger, a Republican from Stillwater; Mark Lawson, a Republican from Sapulpa; Carl Newton, a Republican from Cherokee; and Monroe Nichols, a Democrat from Tulsa. Brian Jackson, who lost big in Tuesday’s Republican primary race in a Tulsa-area Senate district, talks about what the primary results mean for the “teacher caucus” challenge.